An exciting mixed commercial portion of land ideal for a range of commercial, retail and business park development is being made available by Tongaat Hulett Developments, the property development operator within the Tongaat Hulett stable. The new release forms part of the greater Cornubia development, a multi-billion rand collaboration between the eThekwini Municipality and Tongaat Hulett. The first of its kind in KwaZulu-Natal, Cornubia is a fully integrated human settlement development. This opportunity, representing 85,000 m2 of commercial bulk, comprises five stands of varying sizes and is situated immediately to the north of the upmarket Mount Edgecombe estate, and forms part of the western expansion of Umhlanga Ridge. Located adjacent to Investec’s new Cornubia Shopping Centre currently under construction and the future Cornubia Town Centre, the site is expected to benefit from enhanced access due to interchange upgrades. The N2/M41 interchange is currently under construction and the new Flanders/M41 interchange is scheduled to commence in September 2015, for completion in February 2017. 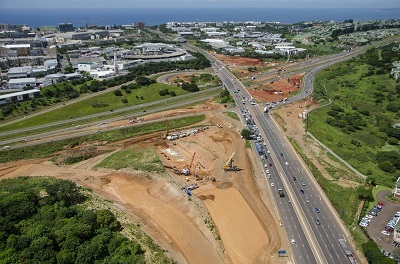 Other arterial connections in the pipeline include a link to the Umhlanga Ridge Town Centre and the N2 via a further interchange on the N2 to the north of Gateway. In the heart of Durban’s northern development zone, the site is also located on the GO!Durban route, eThekwini’s Integrated Rapid Public Transport Network, that will provide convenient access for staff and customers alike. Well-established businesses currently operating on Flanders Drive, which flanks the Cornubia Business Hub, include Sage, several motor dealerships, such as BMW and Kempster Ford, as well as Mt Edgecombe’s Virgin Active gym. “We are looking to sell this to prospective developers,” explains Mike Deighton who is responsible for the company’s developments, “who would be able to construct suitable facilities for a range of end users. We believe that this represents up to a R3 billion investment opportunity for the right entity. 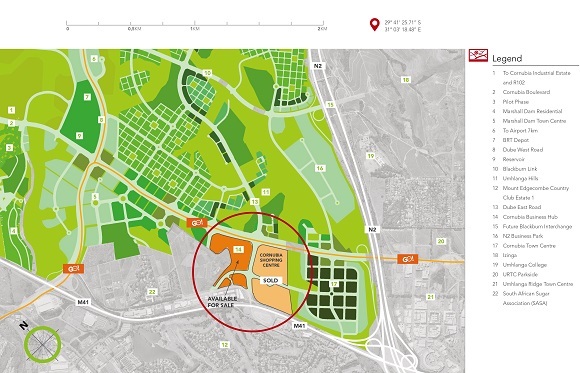 ” This entity could ideally develop the entire precinct, maximize the opportunity and by acquiring early access to a highly attractive precinct likely to shape the future of the surrounding area, play a leading role in the expansion of Umhlanga Ridge over the next few years. The company has called for prospective buyers to submit offers by the 8th September. This represents an ideal opportunity for the development of high-end retail, office or business space in an excellent location within Durban’s burgeoning Northern Urban Development Corridor. Construction is well underway on the interchange which will allow easy access to the Cornubia Business Hub. The interchange is due for completion in February 2017. The map shows the Cornubia development which is an exciting mixed commercial portion of land ideal for a range of commercial, retail and business park development is being made available by Tongaat Hulett Developments. Tongaat Hulett is an agri-processing business which includes the integrated components of land management, property development and agriculture. The company’s development arm has established a reputation for excellence as one of South Africa’s leading private land developers, having planned and developed more than 2000ha of serviced land for residential, commercial, industrial, resort and mixed-use purposes. In collaboration with key stakeholders, the company is uniquely positioned to take on projects on a massive scale.